Join the College of Science for an exploration of ecological enlightenment at this semester's installment of S.M.A.R.T. Talks, where we share how "Science & Mathematics Advances Research & Technology"! The series was created to highlight the outstanding scholarly work of COS faculty and bring the UNT community together to discuss scientific breakthroughs and learn about the building blocks of the world around us. 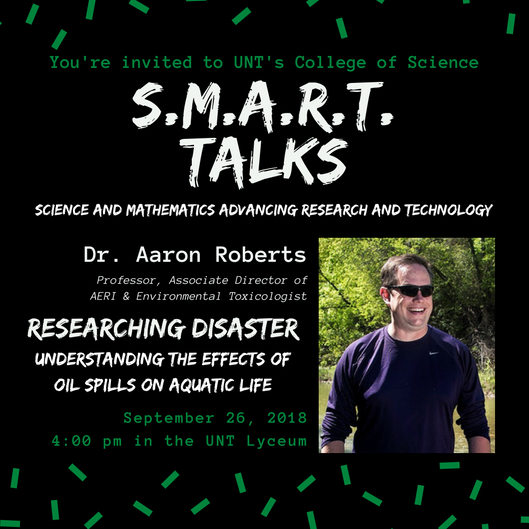 We are proud to welcome Dr. Aaron Roberts, Biological Sciences Professor and Associate Director of UNT's Advanced Environmental Research Institute, to share with us his work and research at SMART Talks in the Union Lyceum at 4 pm on September 26. Dr. Robert's engaging lecture is titled "Researching Disaster: Understanding the Effects of Oil Spills on Aquatic Life." All College of Science faculty, staff, alumni, and students, are encouraged to attend this free event, and everyone within the UNT community and beyond are also invited to participate. A reception will be held immediately afterwards. Dr. Aaron Roberts is a professor of environmental science in the Department of Biological Sciences and associate director of the UNT Advanced Environmental Research Institute. He is an environmental toxicologist who's research on the fate and effects of environmental contaminants has received more than $3 million in funding from federal, state, and industry sources. His work has resulted in more than 50 scientific publications and been cited more than 1300 times. Sixteen graduate students and postdocs as well as twelve undergraduates have conducted research toward their degrees in Dr. Roberts's lab at UNT over the past 12 years. Dr. Roberts is an expert on the effects of oil spills on aquatic organisms. His laboratory was one of the lead testing labs for the Natural Resource Damage Assessment of the 2010 BP-Deepwater Horizon oil spill in the Gulf of Mexico which resulted in a settlement of $18.7 billion, the largest environmental settlement of its kind in U.S. history. In his talk, Dr. Roberts will discuss his lab's role in the Deepwater Horizon assessment as well as ongoing efforts to better understand the effects of crude oil exposure to better inform future oil spill response.